I'm sure it comes as no surprise to my readers that I am a big fan of to-do lists. I'm a busy person with a lot of things to keep track of (aren't we all? ), and trying to keep things in my brain is just stressful (and often literally gives me a headache). I truly believe writing things down helps me both relieve stress and take care of my various responsibilities. Today I want to talk about a very specific type of to-do list, organized by theme. First of all, what do I mean by a "themed to-do list"? I am referring to lists of action items that are all related to one event or larger task, usually being completed over a longer period of time (several weeks or even months). I often make to-do lists for myself. I have space to write down general to-do's each week in my life / teacher / home planner, and I also write to-do's for each day on my dry erase command center. I also will write little lists for myself when I have a day full of random errands or tasks to do during my planning period at school. But those lists are all a collection of random, unrelated items that are only together on one list because they are all things I want to complete that day or week. When I have bigger projects, I find that incorporating those tasks into my regular to-do lists is counter-productive. If I just write down "do all the stuff for such-and-such huge thing" as one item on my to-do list, that isn't useful (and can often produce more stress, not reduce it). 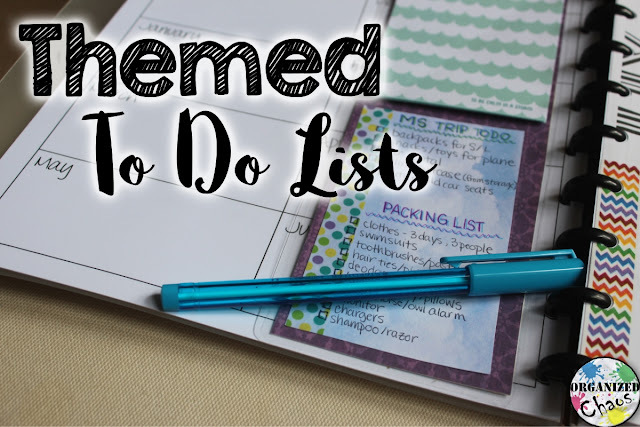 If I try to write down each task within the larger item on my to-do list, it becomes cumbersome, and I end up copying the same items from week to week, list to list, because I can't (and don't need to) complete everything within that week or day. This way I can continue to reference it as needed, checking things off and adding items, without having to move the list from week to week. Then when the project is complete, I can just take it off and throw it away. 1. Vacation planning: (pictured above) Write down everything you need to get done beforehand- booking travel and lodging, contacting people, planning outings, etc- and make a packing list. I have a lot of helpful calendars, packing lists, etc in my summer organizer if you need help getting started. 2. Party planning: I used a separate list when I was planning a baby shower a few months ago. Write down all of the tasks- invitations, food prep, decor ideas etc-, keep a running shopping list, and keep track of guests / RSVP's. 3. Holiday planning: This is similar to party planning, but if you have a big holiday like Christmas that you are planning several different events for, you can keep everything in one big list with different sub-sections: gift shopping, party planning, "bucket list" of Christmas-y things to do with the family, baking lists etc. I wrote about the bucket list I made of small things to do with my preschool-age daughters in this post if you want some ideas. I also have a holiday organizer with lists you can fill out for each of those sub-categories if you need a little help organizing everything (this is what I have used the last 2 years!). 4. 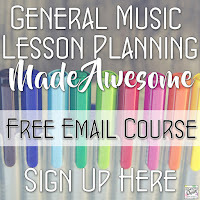 Concert planning: If you are a music teacher, this is one of those things you are always working on. There are so many small items that need to get done over the semester to prepare for a concert or other performance: contacting volunteers, recording, staging, space reservations, equipment/props, rehearsal schedules, auditions, sending reminders, and more. If you want some help organizing all of that information, you can use this performance planner to help make sure you don't forget anything. 5. Spring cleaning: Whatever time of year you do it, if you're hoping to do a major clean-up at home, it is a good idea to start a list with all the things you want to clean. I usually do this over the summer, and make a list of places and things to clean so I can check them off as I do them. 6. Moving houses: This was definitely a helpful one for me this past fall when I was in the process of buying and moving into my new house! I had a running lists of tasks for the buying process- documents I needed, appointments, people to contact, information to gather, forms to fill out- and another list of things to do for the move itself- packing, cleaning, all the places I needed to change my address etc. 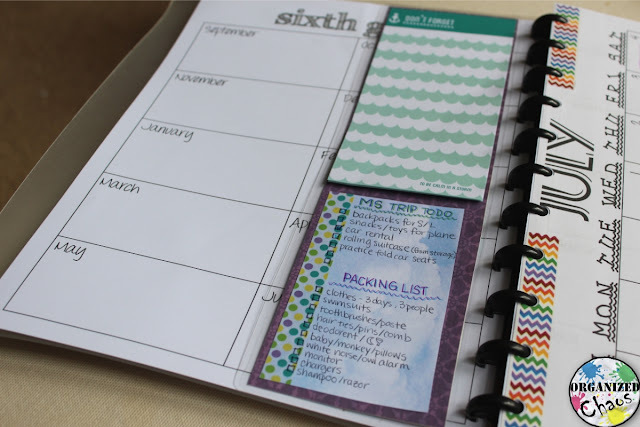 I hope these ideas get your own juices flowing so you can be more organized and less stressed when you have a major project looming! Have you ever made a themed to-do list? What was it for? Share your thoughts and ideas in the comments below! Want more? 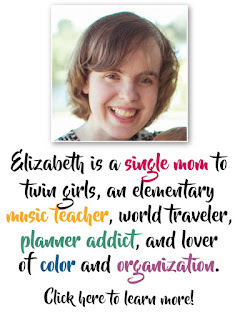 Subscribe here to the Organized Chaos newsletter and get music teacher ideas and resources for home and school sent straight to your inbox! You're so much more organized than me! I just have a "to-do" list that is always longer than I want it to be! With my concert less than a week away, perhaps I'll try a themed list this weekend! Thanks!